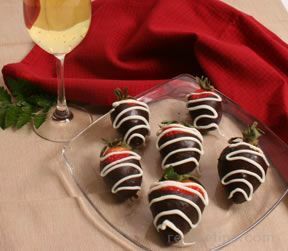 The ideal, easy to prepare confection for afternoon tea or elegant dinner parties. CAKE: Prepare cake mix per package instructions. Pour cake batter into a floured jellyroll pan and smooth top with spatula. Bake for 20-25 minutes or until firm to the touch. Place in freezer overnight. Remove frozen cake from jellyroll pan by inverting onto a piece of parchment paper. Cut into small squares with a serrated knife. Place squares onto a parchment lined baking sheet. Freeze a minimum of 1/2 hour or until ready to glaze. 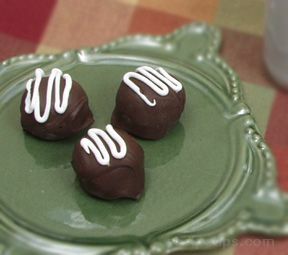 CHOCOLATE GLAZE: Combine powdered sugar, water and light corn syrup in a saucepan over low heat. Stir constantly until the mixture is blended well and is smooth and appears shiny. Remove mixture from heat, stir in almond extract and chocolate. Continue to stir until chocolate has completely melted. If necessary, place over low heat again. 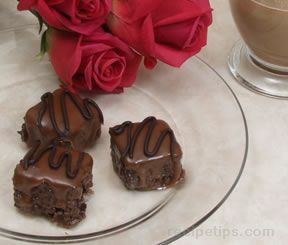 Remove small cake squares from freezer and dip into melted chocolate. Place on wire rack to allow excess chocolate to drip off. 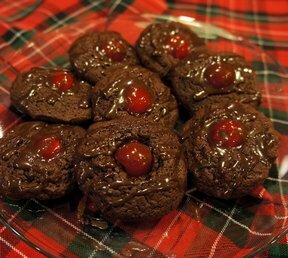 Allow coated cakes to cool, remove from rack and place on parchment covered baking sheet. Place in refrigerator until ready to serve. Decorate prior to serving.